As you may have gathered by now, I am an avid soup lover. I just find it so comforting and love the many different flavours and textures that you can get out of one simple bowl. 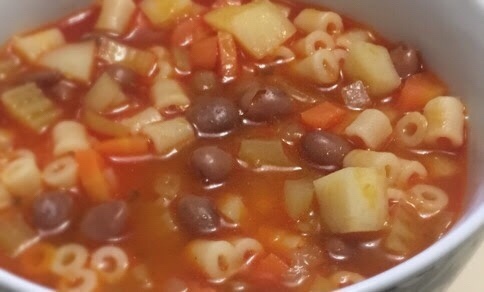 Today’s soup is one I made multiple times during my pregnancy, one of the reasons for this is because it’s so easy to make in batches and freeze, making it a perfect weekday meal, especially as I grew heavier and more and more tired each evening after work. Not to mention how warming it is during the winter. The pasta choice is up to you but I personally found that it tastes best with ditali pasta (which I could only find in Asda! ), but will work just as well with orecchiette, conchiglie, cavateli…basically anything small and tubular really. The stars of this dish though are the borlotti beans, and I feel I should mention that I couldn’t find them in any major supermarket chain except for Tesco, so if you plan to make this, please make sure you find the beans first. Chop up the celery, carrots, onions and chilli in small cubes and fry them for a few minutes along with the rosemary. Add the potatoes and cook for a few minutes. Wash and drain 1 can of borlotti beans. Add 2/3 to the pot and blend the last 1/3 into a paste, add that in the pot with 1/2 cup of passata, enough water to cover everything plus about 3 fingers on top and 1 stock cube plus salt and pepper. Bring to a boil and then take it to a slow simmer for around 40 minutes with the lid on, then take off the heat and leave it to rest for about 15 minutes. In a separate pot cook the pasta. Once the pasta is cooked add it in the soup and enjoy it hot.